A wide range of weather is a big part of living around Lacey, WA and the greater Pacific Northwest. It is hard not to bring some of this weather into your vehicle, making the floor look less than pristine. The Genuine Kia all-weather floor mats available near Tumwater, WA at Hanson Kia are the ideal solution for keeping floors free from all that mother nature and even other forces send your way. These high quality all-weather floor mats are designed specifically to fit your Kia and they are even oil resistant. Cleaning these mats is as easy as spraying them off with the hose and a quick wipe. Try that with carpet floor mats! These genuine Kia all-weather floor mats are also great for those with little ones. Discarded snacks and beverages are well contained on Kia all-weather floor mats for easy cleaning. They will also prevent that bottle of milk from rolling under the seat only to be found once the smell demands it. Come get a set of our in-stock Kia all-weather floor mats and see what else is available at Hanson Kia where residents from Centralia, WA know the short drive is well worth it. 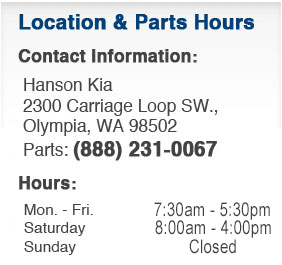 Taking the best possible care of a Kia is easy at Hanson Kia where we're just a short drive from Chehalis, WA. We take pride in superior customer service and our exceptional inventory throughout the dealership. Get the right genuine Kia parts and accessories at the Parts Department and take advantage of regularly updated specials. Ensure the highest quality installation with the help of factory trained and certified technicians in the Service Department who also take pride in outstanding service and repair of all vehicles. When the time comes to upgrade, don't miss out on the specials throughout our huge inventory of new Kia vehicles. We also keep a wide variety of quality used vehicles on hand to meet the need of every customer. Hanson Kia is proud to serve customers from Grays Harbor, WA so drop by and visit at 2300 Carriage Loop SW, Olympia, WA 98502. The Parts Department is happy to answer any questions and take orders by phone at (888) 231-0067.